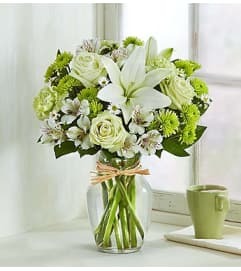 Make their day lucky indeed with our stunning fresh green and white bouquet of carnations, poms, monte casino and more. Hand-arranged in a classic glass vase, it arrives with a removable green boutonniere they can pin on a lapel for the traditional "wearing of the green." 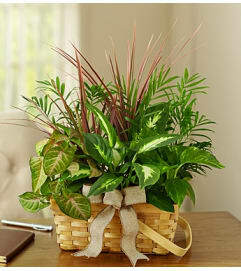 A terrific way to wish them luck and bring them peace for the St. Patrick’s Day celebration. 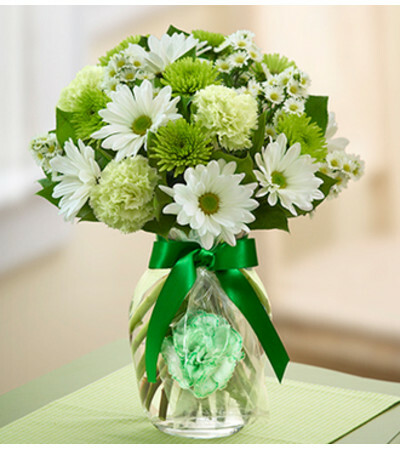 The freshest carnations, poms, monte casino and salal, all in gorgeous shades of green and white. Paired with a single green carnation boutonniere they can remove and wear.